Mount Nebo is a series of peaks at 817m above sea level 25km southwest of Jordan. The site is of great significance to Christianity, Judaism and Islam. According to the Bible, Mount Nebo is where Moses was shown the promised land that God would give to the Israelites. Mount Nebo is also supposedly the place where Moses was buried by God himself. After Moses' death his successor Joshua went on to lead the Israelites across the river into Canaan. Mount Nebo is an archaeological site with ruins of a 4th century church, the Moses Memorial church, as well as of other old structures. 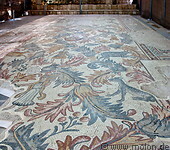 Well preserved floor mosaics are visible on the site.